Help Your Dry Cracked Feet! Made in New Hampshire. Moisturizes and repairs dry, cracked feet & heels. Peppermint oil revives hard-walking, long-standing feet. Essential oil blend contains ingredients known to have antibacterial and antimicrobial benefits. No petrolatum or chemicals of any kind. Do Your Feet a Favor! Long-Walking Lonesome Badger Bob says: "Two paths diverged in the woods and I... I took both of them... but I couldn't have done it without my Foot Balm!" 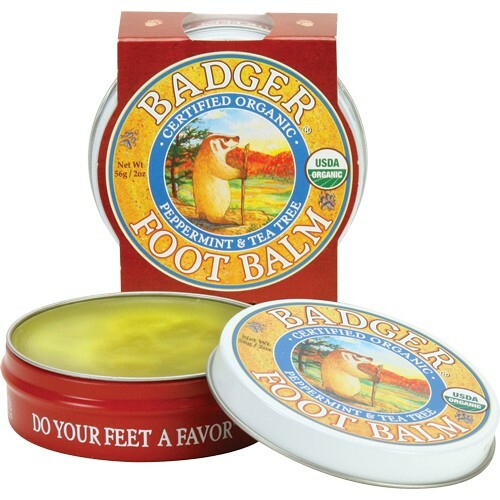 That's because Badger Foot Balm helps to revive hard-walking, long-standing feet. Peppermint, Tea Tree and Rosemary are cooling and refreshing essential oils that exhibit antibacterial properties. Organic Extra Virgin Olive and Jojoba Oils provide superior soothing properties, healing even the roughest, driest, most cracked feet & heels. You'll fall in love with the tingly-cooling feeling and fantastic fresh scent. Perfect for wandering Badgers everywhere - this stuff rocks!